Whether you’re just starting high school or a college senior, there are some songs that follow you throughout your education. Maybe John Mayer’s “No Such Thing” was your senior class song (along with half of America’s seniors from 2002 on.) Maybe you danced to Vitamin C’s “Graduation Day” at your very first formal. Maybe you listened to Green Day’s “Good Riddance (Time of Your Life)” in fifth grade and it’s been haunting you since (or the other 50% of you had it as your senior class song…) Whatever your song or whenever you heard it, there are always tunes that remind you of the good old days spent in high school, help you get through your school career, or tell the story of college life. Here’s a list of 10 of those songs. You won’t find John Mayer or Green Day here, but each song captures all of the emotion of being at school yet again, from the first feelings of a crush, to the never-ending friendships, to the rush of being young with a road of dream and promise ahead of you. 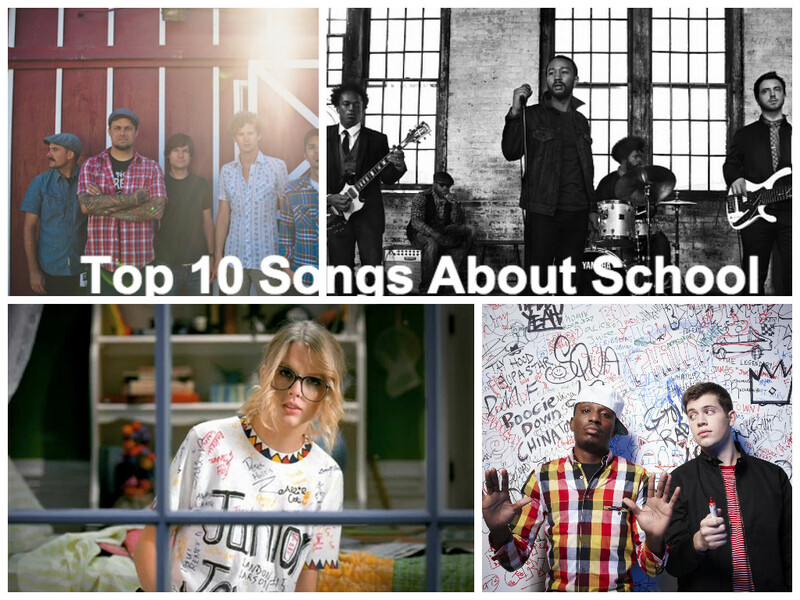 These are the happy songs of school days that celebrate all that having an education can get you. Enjoy, and share your favorite school songs in the comment section! “Be True to Your School” is the perfect way to start this list. Sure, the song is anything but modern, but this Beach Boys anthem still rings true. No matter how much you want to leave your town or how much you wish high school and its drama is over, be true to your school when you can. Show spirit, attend pep rallies, dress up on costume days, wear a tee-shirt that has your high school’s logo on it. There’s no better way to get involved and get excited about school than to represent by showing your colors while you can; be happy and enjoy your days in high school, even when it seems hard! Even the most spirited members of a high school have their moments of weakness. A town can wear you down and all of the drama of the day can take a toll on your spirit. At these moments, there are only two things that can make any day better, friends and family. High school friends become one of the best parts of home, every time you walk away from your hometown, you’ll ache to see their faces and hear all of your inside jokes. They’ll become your brat pack, the people to come home to and take the town by storm. Excitement and nervousness can be caused by a lot of things but in high school the one thing that causes the most stress and possibly the biggest amount of fun are dances. Relient K has a multitude of songs about school but “Sadie Hawkins Dance” is one of my favorites. Impossibly upbeat with fun lyrics, this tune will make you want to dance whether you’re in your room or busting moves on your gymnasium floor. While this song may not be about high school specifically, it is about one kid’s rise to the top. He has a dream and sitting in class, while helpful for education’s sake, isn’t going to bring him the glory he desires. His dream is to rise up and find success, and with the power of his education behind him and the glory of being something bigger than his town believed, he does it, and refrains from “growing up” during the process. The title of this song is self-explanatory. Blink sings about a lot of relatable topics, and this one hits the nail on the head around school time. No one is ready to leave their friends and family and loved ones to move onto a new adventure but you have to. Blink captures that feeling in this song, all the worry and heartbreak and new experiences. Walking around the campus, you see someone you want to talk to. Maybe you’ve met before, maybe they’re just a face you keep on seeing. “Campus” captures those feelings of awkwardness and deja vu, all too familiar at college. These lyrics speak to anyone who wants to be lazy but finds themselves sitting in a class, failing to pay attention and learn a lesson. At these times, when you’re watching the clock, you have to remember what you’re working toward, stop wising to be elsewhere, and log off of Facebook. Remind yourself that you are in college to live your dream and power through! This song is a testament to both the good times and the bad times had in high school: a great time with friends, some mistakes, and plenty of good memories. By the graduation day, it’s time to give up high school drama and move on to bigger and better things, things that will make you become who you want to be, but there’s always time for one more weekend of fun and the certain freedom that only high school can bring. John Legend’s “Shine” is not about the memories of high school or the new found freedom in college. “Shine” is a beautiful call to action. Legend’s song was featured in the film Waiting for Superman, a documentary about the education system and how we can help children succeed if we give them a chance. If we give a child the opportunity to get into a school that will challenge them and allow them to learn at their own pace and by their own methods, they will be more likely to lead a life of goodness and greatness. People from all walks of life deserve that chance and have the ability to become legends through education. Next ArticleTV Review: Under the Dome 1x11 "Speak of the Devil"